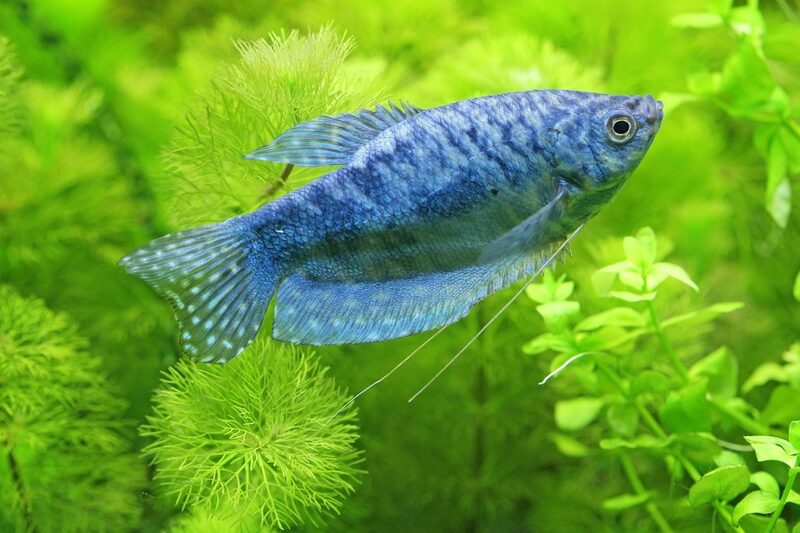 One of the most popular freshwater aquarium fish is the Gourami fish. These fish are found at virtually every pet store and are a staple for the beginning hobbyist. They come in a variety of colors and generally make for good tank mates in a community set up. We’ll start by looking at the gourami species as a whole and then take a brief look at the subspecies. The Gourami family Osphronemida are freshwater tropical fish found primarily in Asia. A unique feature of this species is that — like the Betta — they can gulp air from the surface of the water thanks to a lung-like organ. 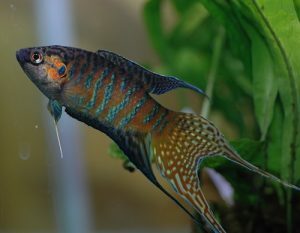 As mentioned, there is a wide variety of gourami fish to choose from, and while they generally make for good tank mates in a community aquarium, some don’t get along well with other fish or members of their own species, while others are far too shy to be kept with more aggressive fish. Regardless of your tank size and its current or planned occupants, you should be able to find a gourami fish to suit you. Gourami fish range in size from 1.5 inches up to nearly 6 inches so the smallest recommended is a 20 gallon for the smaller fish, and at least a 35-40 gallon for the larger varieties. As always, it also depends on how many fish you’re planning on having in your tank; just be aware that overcrowding can cause a spike in nitrates, which can poison your fish. While most of the Gourami fish are very hardy and adapt quickly to changing water conditions, you do have to be careful for freshwater fish diseases that may crop up. Preventing these diseases takes a little diligence, but is much better than having to deal with an outbreak that can affect your whole tank. 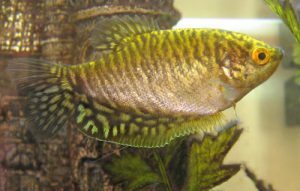 Perhaps the most common disease affecting freshwater tropical fish such as gourami fish is freshwater ich. This — like many ailments — can be brought on by stress, which can be caused by poor diet, poor water quality and housing them with inappropriate tank mates. Freshwater ich manifests itself as tiny white spots and ‘scratching’ behavior. Gourami fish are also prone to bacterial and parasitic infections that can result from a pH imbalance in the water or a buildup of nitrates caused by excess food and fish waste. 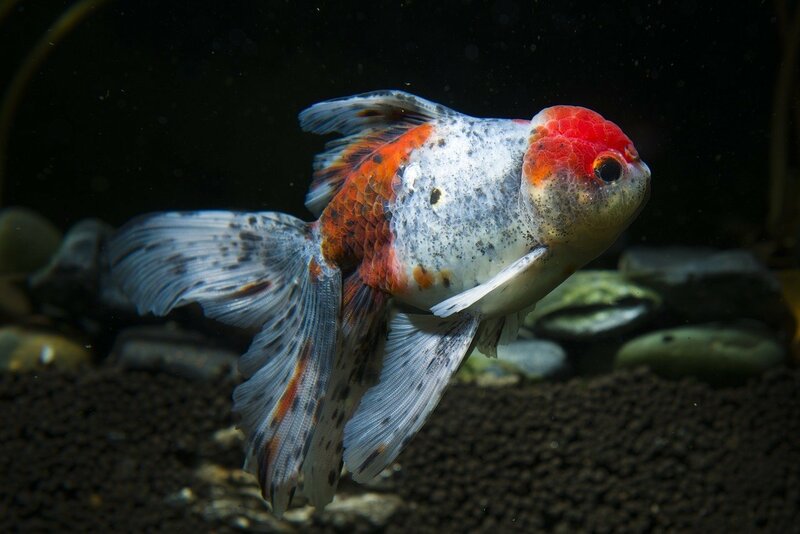 The key to preventing these diseases and keeping your tropical fish healthy is to perform regular water quality tests and make appropriate water changes as needed to keep levels stable. In addition, make sure your gourami fish are fed a high quality diet to keep their immune systems strong so they’re better able to fight off an infection should they contract one. Gourami fish are omnivores and require a high quality diet in captivity to maintain good health and their beautiful colors. They are generally voracious eaters and will happily accept a variety of foods. It’s been said that these fish are very hardy and can subsist on a lower quality diet, but this isn’t a good approach because poor nutrition can lead to a decrease in their immune system, which can lead to them getting a variety of freshwater fish diseases. So always strive to give your fish the best food you can for optimum health. A staple of gourami fish diet in the home tank includes a mix of dry and frozen foods that are supplemented with the occasional live treat. You can also give them fresh vegetables such as lettuce and peas to round out their nutrition. They are also very fond of brine shrimp as well as worms, so consider adding these as a treat every now and then. 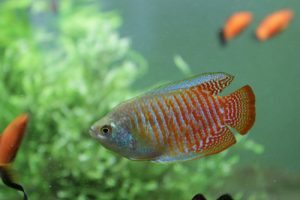 Gourami fish are easy to breed in the home aquarium. All of the gourami species are egg layers and many of them build bubble nests on the surface of the water to house the eggs and fry. If you decide to try your hand at breeding these fish, it’s recommended that you set up a separate breeding tank and be sure to provide the female with plenty of hiding spaces because the male will often bother her. Keep the water pH between 6.6-7.6 and be sure the female gets meaty foods like bloodworms or brine shrimp. Once they fry arrive, you can feed them with newly hatched brine shrimp. Once they grow to be about 1/2 inch long, you can house them back in the community tank with their parents. As mentioned, there are a many sub-species of gourami fish to choose from, each with their own quirks, personalities and considerations when it comes to putting them in a community tank. The follower are some of the more popular varieties you’ll find. The Dwarf Gourami (Colisa lalia) is sometimes called the powder blue gourami because of their light blue coloring. These fish generally grow to about 2 inches and should do nicely in a smaller tank of about 10 gallons. 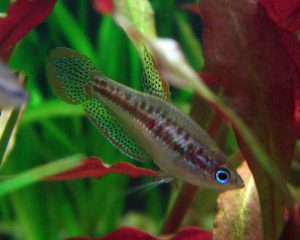 The Dwarf Gourami is docile and prefers to keep to itself, which makes it an ideal tank mate in the community aquarium and for the beginning hobbyist provided you don’t house them with large, overly aggressive fish. The Dwarf Gourami prefers a water pH of between 6.0-7.5, and temperatures of 72˚-82˚ Fahrenheit. The Pearl Gourami (Trichogaster leeri) somewhat resembles the angelfish in that it has long, flowing tendrils dangling underneath its body. As with the Dwarf Gourami, the pearl is peaceful and gets along well with most of their tank mates in a community aquarium. Male pearls, however, will fight with other male pearls especially if there are female pearls in the tank and it’s the mating season. 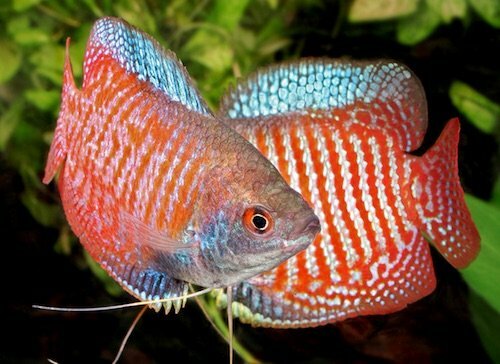 The Pearl Gourami grows to approximately 5 inches, so plan on at least a 30 gallon tank. In the wild, the Pearl Gourami fish inhabit waters that are acidic, but the readily adapt to a wide range of water conditions. That said, aim for a pH of 6.0-8.0, and a temperature of 77˚-82˚ Fahrenheit. 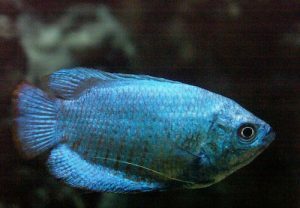 Named for its bright blue coloring, the Blue Gourami (Trichogaster trichopterus) is also called the Three Spot Gourami, the Opaline Gourami and the Cosby Gourami. They grow to approximately 4 inches and should do well in a 20 gallon minimum tank. 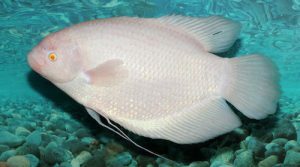 As with the Pearl Gourami, this fish likes the water slightly acidic — pH 6.0-8.8 and a temperature between 72˚-82˚ Fahrenheit. Also, like the Pearl Gourami, the blues are peaceful and get along well in most community tank environments, however, the males will fight each other. 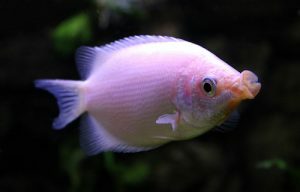 Perhaps one of the most popular of the gourami fish is the Kissing Gourami (Helostoma temmincki). These fish are so named because when defending their territory, they appear to be kissing one another. As with the previously mentioned species, the Kissing Gourami is peaceful and generally does well when housed in a community tank. They typically grow to 2 inches in length, which makes the suited to smaller tanks such as a 20 gallon. Their preferred water pH is 6.5-7.0 and the temperature is 64˚-74˚ Fahrenheit. Sometimes referred to as the Pygmy Gourami, the Sparkling Gourami (Trichopsis pumila) is one of the smallest varieties of gourami fish growing to about 1.5 inches, which makes them suited for smaller tanks, minimum 10 gallons. While these fish are good for the beginning hobbyist, it should be noted that they need to be introduced into a biologically mature tank that’s been cycled. Also, while they don’t require an abundance of care and attention, you will need to stay on top of water quality to ensure their good health. Also, being a smaller fish, they are very shy and will need plenty of hiding places to duck into when they feel threatened. They do make great additions to most community tank set ups, however, it’s not recommended that you put them in with overly aggressive or larger tank mates that will intimidate them. Also, unlike other gourami varieties, you can successfully keep a group of sparkling gourami fish with little incident. These fish prefer water on the acidic end of the scale, preferably pH 7.0 and a temperature of 76˚-82˚ Fahrenheit. As its name implies, the Giant Gourami (Osphoronemus goramy) is a beast of a fish and not recommended for most hobbyists simply because they grow so large that most home set ups won’t accommodate their size, which can get to 27 inches. If you do decide to keep one of these beasts at home, plan on a tank size of at least 200 gallons. If you’re keeping them in a community environment, be aware that they will eat smaller fish, and they will fight with others of their own kind. You’re best off keeping these fish with other large fish. 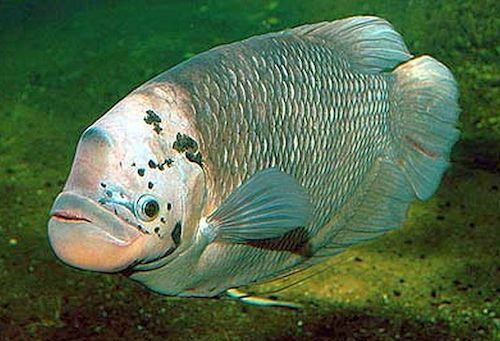 Water conditions to keep the giant gourami happy are a pH of 6.5-8 and a temperature of 68˚-86˚ Fahrenheit. The Gold Gourami comes from selective breeding and is an offshoot of the Three Spot Gourami. 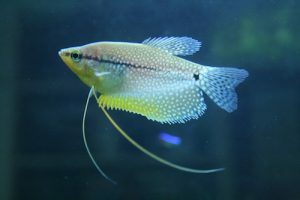 As with many varieties of gourami fish, the Gold Gourami is a hardy fish that’s easy to care for, which makes them ideal for the beginning freshwater aquarium enthusiast. The Gold Gourami makes for a good tank mate in the community aquarium when they’re young, they can become temperamental in adulthood, which means they won’t always tolerate their tank mates or others of their own kind. Gold Gourami fish can grow up to 6 inches, which means you’ll want at least a 35 gallon minimum tank size. Water conditions for this fish are as follows: pH 6.0-8.8 and a temperature of 73˚-82˚ Fahrenheit. The Paradise Gourami (Macropodus opercularis) — while not as popular as some of the other varieties of gourami fish — is still a beautiful specimen that will make any home freshwater aquarium look great. The Paradise Gourami is generally peaceful when young, but can be aggressive once they reach adulthood, so keep that in mind when planning their tank mates. As with many species of gourami, the paradise will fight their own kind. It’s best to keep males by themselves and to avoid housing them with tank mates that might make for a good meal. 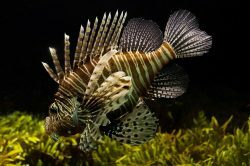 As adults these fish reach about 4 inches in length and you should plan on at least a 20 gallon aquarium for a single, and at least 30 gallons for a pair. Also, be sure to include plenty of vegetation for the female to hide in if you’re housing a breeding pair. These fish like to jump, so be sure to have a secure lid with openings too small for the fish to squeeze through. Water quality should be as follows: Temperature 61˚-79˚ Fahrenheit and a pH of 5.8-8.0. 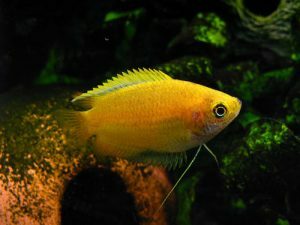 The Honey Gourami (Trichogaster chuna) is known for its vibrant honey color and is a hardy fish that’s easy to care for and well-suited for the beginning freshwater aquarium hobbyist. Like other species of gourami fish, the Honey Gourami has a specialized organ that allows it to breathe air from water’s surface. The Honey Gourami can grow up to 3 inches, which means you’ll want to give them a tank of at least 30 gallons minimum. This species is relatively peaceful and gets along well with most tank mates, although take care not to house them with overly-aggressive species. Many experts recommend using dark substrate to bring out this fish’s color. It’s also recommended to include plenty of vegetation and hiding places for cover. The water quality they prefer is temperature 72˚-82˚ Fahrenheit and a pH of 6.0-7.5. 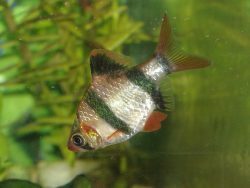 Gourami fish make excellent choices for the beginning hobbyist. They’re very easy to care for, get along well in most community tanks, they’re easy to breed and are widely available in most pet retailers. With the proper care, these fish can live a long time.